David Charvet before and after nose job plastic surgery? 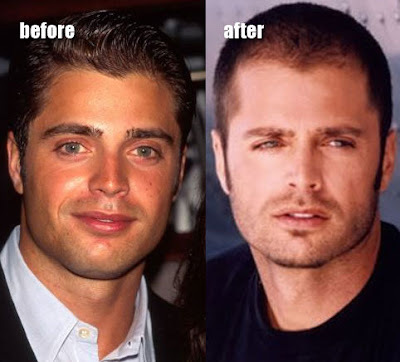 David Charvet is a French-born actor and singer, who you may remember from the television series Baywatch and Melrose Place. We're no stranger when it come to speculating on celebrity plastic surgery, however we've spotted a few other blogs out there, who simply grasp at straws with their cosmetic analysis. Nancy Pelosi plastic surgery makeover? But lets face it, this is an extremely poor attempt at producing a side by side comparison, the lighting and quality of the after photo demonstrates very poor definition and structural detailing of his face, thus rendering the photo obsolete.